I remember little about V nowadays – I have not returned to either of the mini-series (V & V The Final Battle), nor the TV series. So it has been 25 years since I watched those mini-series on ITV in the summer of 1984. The premise, of a benign Alien visitation that is actually a front for the Aliens to devour the Earth of its resources, including Humans, is spectacular and intense. The special effects of the spaceships appearing in the sky were astounding for the time. The Nazi-imagery of the ‘Visitors’ was sinister, but clearly delineated the good guys and bad guys, and there were further allusions to the Second World War, including the formation of a resistance army of Humans trying to combat the alien threat. Marc Singer, who played Mike Donovan, was cool and heroic as one of the key members of the fledgling resistance, and the evil Alien leader, Diana, played by Jane Badler, was a memorable villain. The first mini-series, V, is very good, but the second miniseries, V The Final Battle, is outstanding. That is because of the introduction of two people – Ham Tyler and associate Chris Farber – who join the Resistance. It is Ham Tyler who is the standout character, and there are so many reasons why. Played with steely authority by the great Michael Ironside, Tyler bursts onto the scene and reveals the existence of an international resistance force that can supply armor-piercing ammunition and the Visitors’ apparent plan to attack the resistance hideout. So we establish he is a man to be feared, with good Intel and the ability to get his hands on awesome weaponry. He calls Mike Donovan ‘Gooder’ (as in good guy…), which sets Tyler apart, as an anti-hero, and anti-heroes are always cooler than heroes, aren’t’ they? Mike Donovan: I prefer them to you. Ham Tyler: I may bring the neighborhood down, but they’ll eat it! Ham Tyler: [looking at a dead Visitor with his reptilian skin exposed] Now that’s a waste of good luggage! until Tyler’s family were betrayed by them. After that, Farber and Tyler become merciless mercenaries, guns-for-hire. The fact that Tyler was joining the Resistance as a matter of his own survival rather than for money or any noble purpose makes him even more appealing – the guy is a true survivor, doing whatever needs to be done to keep on keeping on! Ham Tyler was a streetwise, earthbound Han Solo, an iconic science fiction character. Maybe that is why he shares a name very close to Han Solo (Ham / Han) – an acknowledgement that this guy is true rebel, a grizzled, weather-beaten, crumpled and unwilling saviour. Ham Tyler (aka ‘The Fixer’). 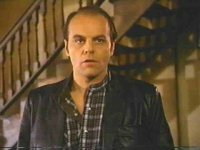 Both him and Farber go on and star in the follow-on TV series of V, becoming pivotal characters. For me though, his importance in ‘The Final Battle’ is crucial – he brings a burst of colour to the Black and White / Good vs Evil scenario. His appearances were limited but when he is onscreen he makes the Resistance an exciting, thrilling cause. Ham Tyler – a true hero of the Resistance.